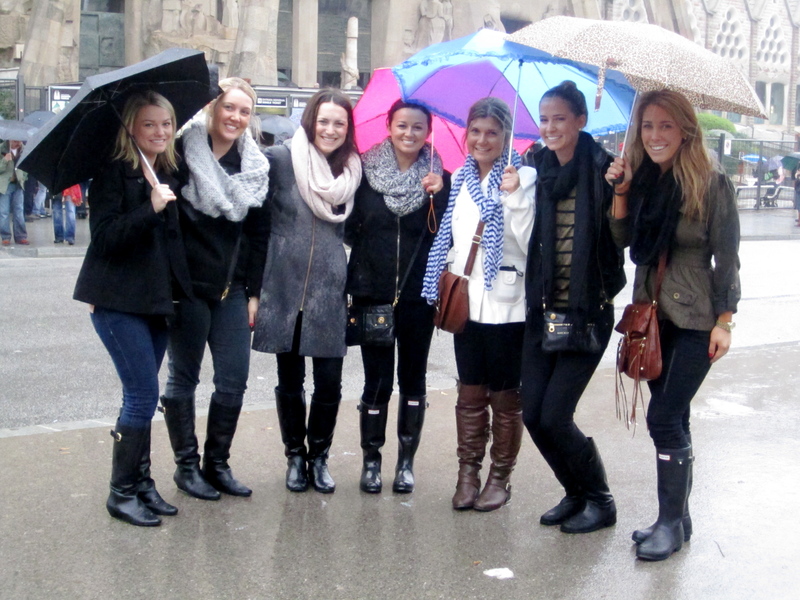 Our latest adventure from the sorority posse was to take a trip to Europe. We visited our foreign friends, Sarah, Brooke, Olivia, Michelle, Jessica Q, and Becca hamburger no cheese Griggs. It is safe to say that this trip may have been the greatest trip of OUR LIVES. It began the day we were about to leave on our foreign excursion. Jen Gumm and I were running around trying to find converter adapters for our hair tools, and buying the necessities for our trip. “Call carms.”Carms is my mom who might have the answers to any problem. Called Carms, she replied, “she can’t go.” Sweet mother of pearl, we haven’t even left the country yet and already there is drama. After a few quick phone calls, praying, tears, and eating, Meg mc managed to find a flight out to Barca on Monday. Relieved, we went to bed, and were prepared to wake up at 5 A.M. Delta calls. Our flight has been delayed till 11 not at 8:30. We have a layover in the ATL and feared we would not make our flight from ATL to BARCA. Things worked out though. We realized or I should say , because Jen had stayed up all night, could get some sleep. I woke up refreshed and ready to go. 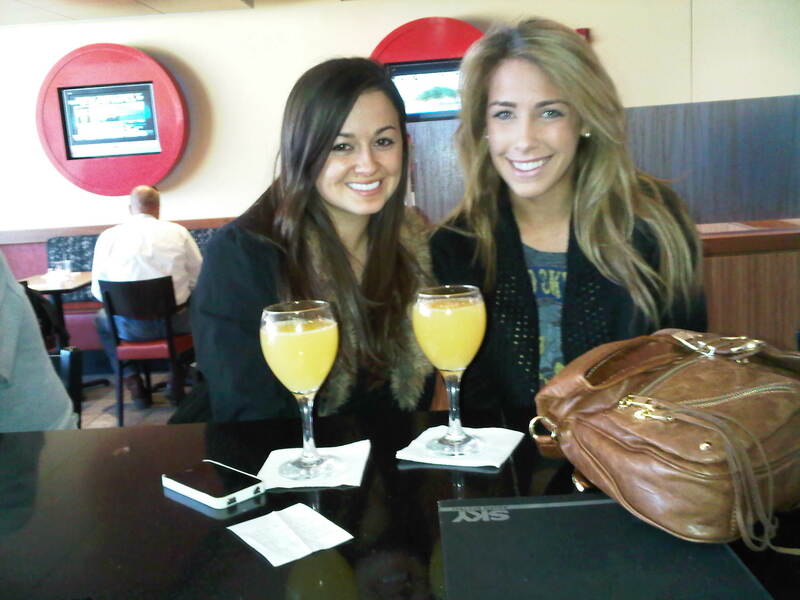 Got to the airport, started off the morning with mimosa’s and starbs. Something happened at the bar, that happened the whole trip. They thought Jen and I were underage. Yet again. This is why we refer to ourselves as ‘les enfants.’ Not only do they think I am underage but they did not believe my picture was me. I have brown hair/resemble a 15 year old boy in my license photo allowing bartenders and security alike to question my identity. “You have blonde hair now?” yes, I do. Is it so uncommon to have changed your hair color from 7 years ago when I took the picture? Apparently so. We got on the plane and were on the way to BARCA. We landed and realized something else. It was so quiet. Nobody speaks. And if they do it is in a very calm manner. We got in the cab and with my minimal knowledge of the spanish language and managed to get to Baby s’s apartment. Cam and Lex arrived, also exhausted but we would waste no time sitting in the apartment. Oh, did I mention it was POURING rain. Like, katrina/ el nino status. FML. Managed to look like a wet rat for most of the time there. We visited Songrata y Familia which I will refer to as Sangria, Then went back for a long nap. We went to the Black sheep aka Ovella negra, and realized that there were 2 in BARCA. 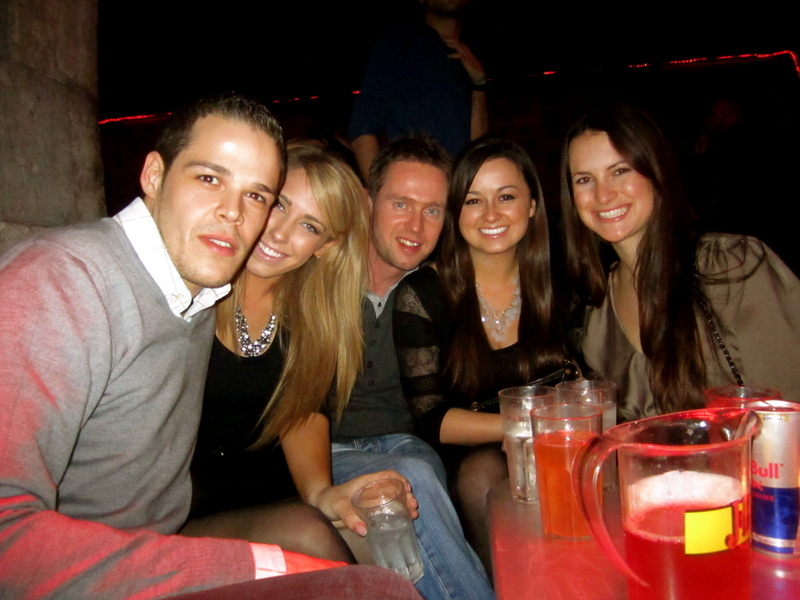 We took the metro to the real black sheep, then went to razzmatazz. I was advised by my friend lauren to NEVER go to this bar, for her friend was put into a sleeper hold and was almost dragged off to be kidnapped. This did not happen, but it was a little sketch, but still the time of our lives. I will not be discussing what occurred after 1 am in europe. Jen ended up sleeping in her suitcase, I on the marble floor. The day of struggle. This is when the jet lag/ staying out till 6 A.M. really hit me. 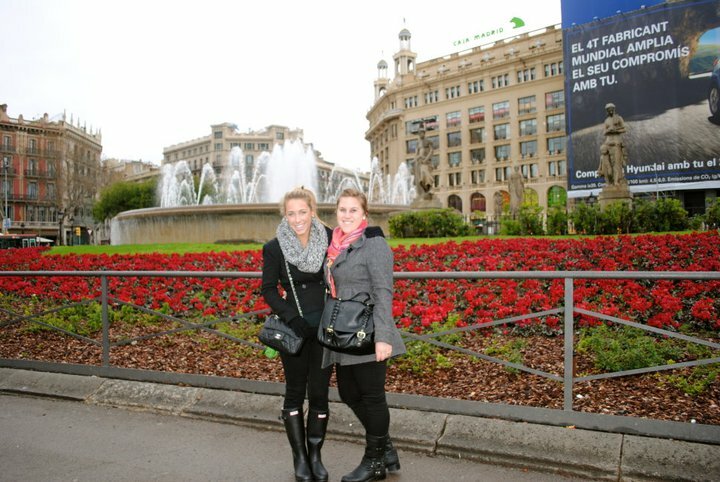 We walked along las rambles, and the rodeo drive of Barca, came home and took another 4 hour nap. Then rallied to go to a karaoke bar. Drank beer, and watched Madame President and Bruk, sing Ke$ha as the closing act. Me, Jen Gumm, Meg Mc, Cam, and Lex all went to Tapas Tapas for lunch and it was incredible! We walked along the Rodeo drive of BARCA and had gelato. I met up my cousin Sarah who is studying abroad there. We had Cafe lattes, and walked to the market place in Las Rambles. It was pouring rain yet again, but I was determined to find the gummies. We then took the metro to Sarah’s apartment where I met her Senora. She spoke no english but I managed to communicate through hand gestures. And it was. Instead of wearing flip flops and shorts we wore cocktail dresses, but the idea was the same as squid row. We took a cab back then decided to pay 15 euro more to go to Mcdonalds. TFM- Total fatty move. With 2 hours of sleep, Jen and I woke up, got in a cab, and made it to the airport. Struggle to the fifth. I had gotten sick. There is NOTHING worse than being sick in a foreign country. I had a sore throat and felt like death. The flight from Barca to Paris was a little rough. Jen gum was praying a Xanex would appear in front of her and I was hoping that god would spare me from dying in paris. But then we arrived. In paris. I can say that it may be my favorite place in the world. Sorry cabo, but you have been replaced. We arrived at Jessica’s appt. Me in ultimate struggle mode, Jen Gum optimistic. Going out that night was not an option. We grabbed Crepe’s and walked around Jess’s neighborhood. It was everything and more. Everyone is fashionable, the men (enough said), the food is unreal. Everything was what I imagined just 300 times more amazing. Jen and Jess aka the twins went to the champs elysees to explore while I lay dead in jess’s blacked out room. Somehow, I managed actually I know how, I was in paris there was no choice but to rally. We went to cafe Les Anemones sat down and had the ultimate parisian experience. Everyone spoke french and smoked. We sat on the sidewalk and watched a night in paris happen. 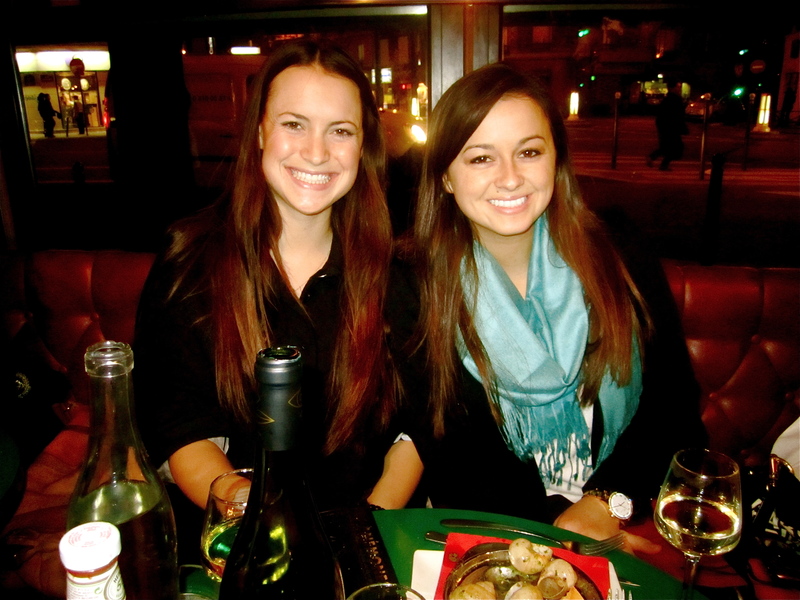 We drank wine, ordered escargot, and enjoyed steak frites et poulet. Les Anemones eating escargot. The twins Jen and Jess. Woke up feeling a little less like death, and ready to go. We visited the tuileries and just had to take it all in. The weather was perfect. We walked to the louvre, in fact a little to far. We could have walked there in 5 minutes instead, it took 30. We saw the seine and finally made it to the pyramid. We found the Mona Lisa, along with other famous paintings and just stared. Though the Louvre houses beautiful art, it is the louvre itself that is the most beautiful. Before versailles this is where kings and queens lived. It was time to leave the louvre, and go to the champs elysees. We noticed that everyone was staring at us/ looking at our feet. Apparently no one in Paris, wears brown boots with black. Oh well. Before stopping at Cafe Le Deauville, we stopped at Laudree. 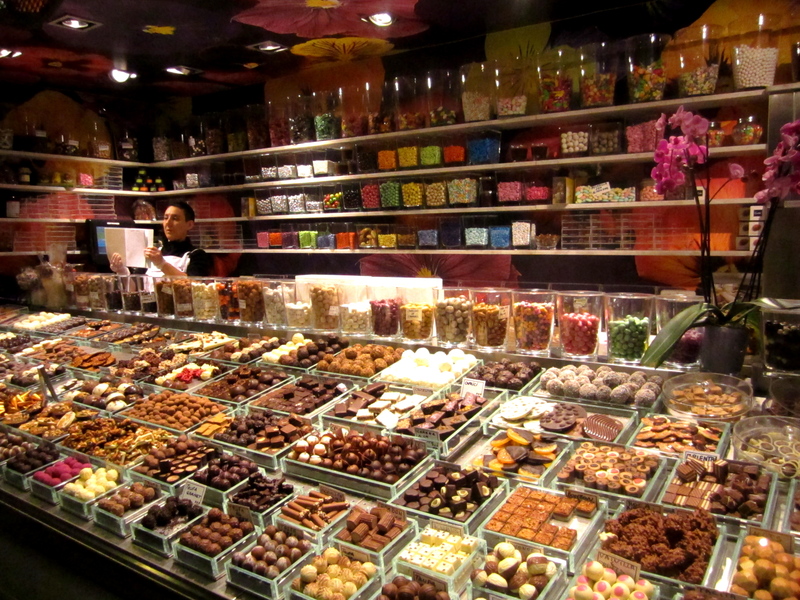 Typical parisian patissiere just on steroids. 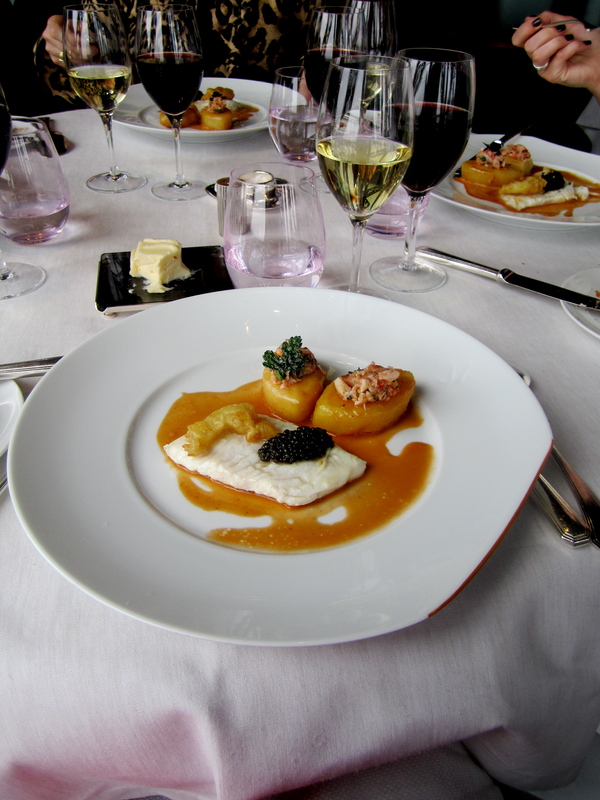 Had lunch, ordered in french, the waiter laughed and responded in english, very typical in paris. 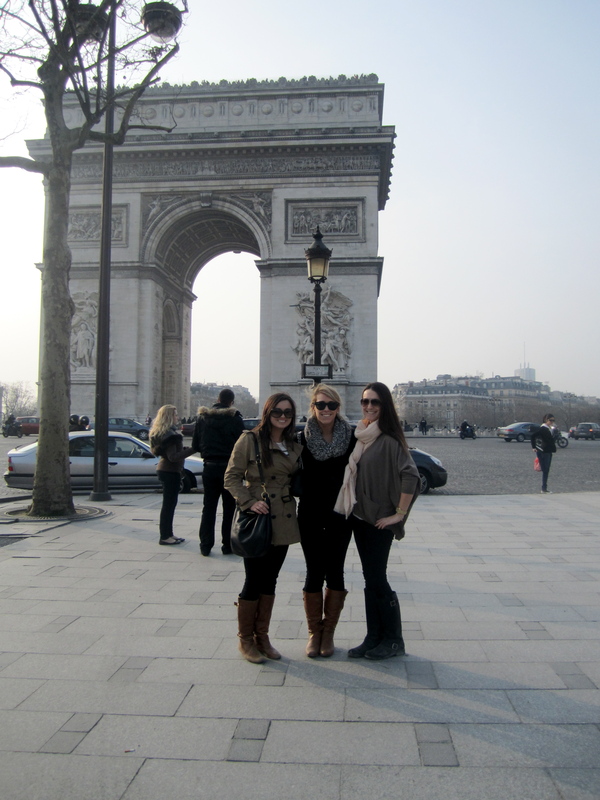 Met up with Jess and walked to the Arc Di Triomphe. Jen, me, and Jess at the Arc. Went to the top and overlooked all of Paris, including the Eiffel tower. There are no words, just pictures to describe that moment. Walked home, made dinner, then went to Cha Cha for drinks. Made a few friends. 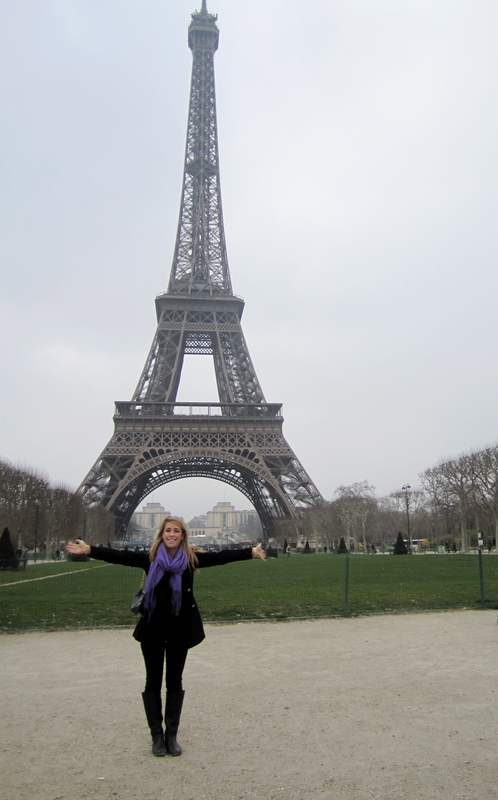 Ran to the Eiffel Tower, for our lunch at Le Jules Verne, it was a little pricey: 489 Euros. Whoops. Translates to 500 something american dollars for 4 people. When in rome right? Got to Notre Dame, and looked at the seine. Everything was a postcard in Paris. We got on the metro then took a nap. We went to an Irish pub, made some friends. Again I will not disclose what occured after 1 am, but we were walking around the streets of Paris at 6:30 A.M.
Friday: Our Mary-Kate and Ashley moment/ Lizzie Mcguire Movie Status. 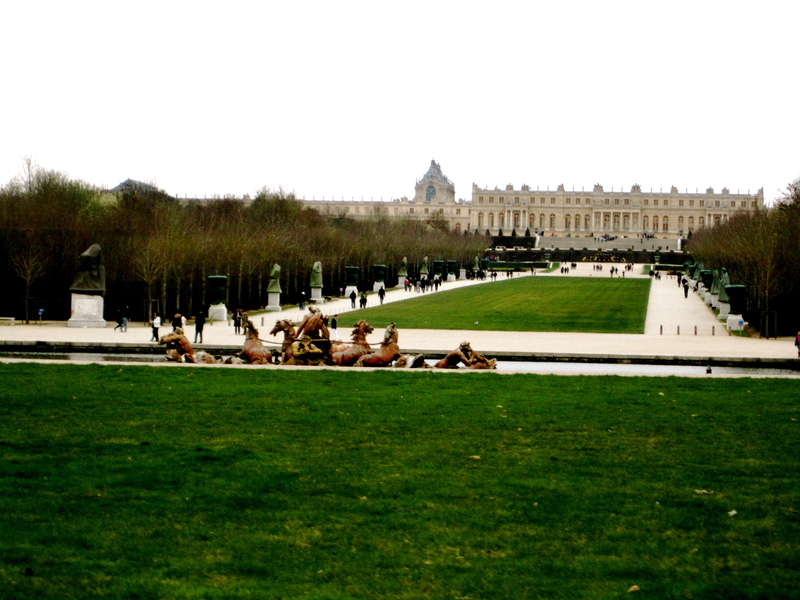 The day of Versailles. We took the RER and arrived. Never have I seen something so incredible. It was everything and more. 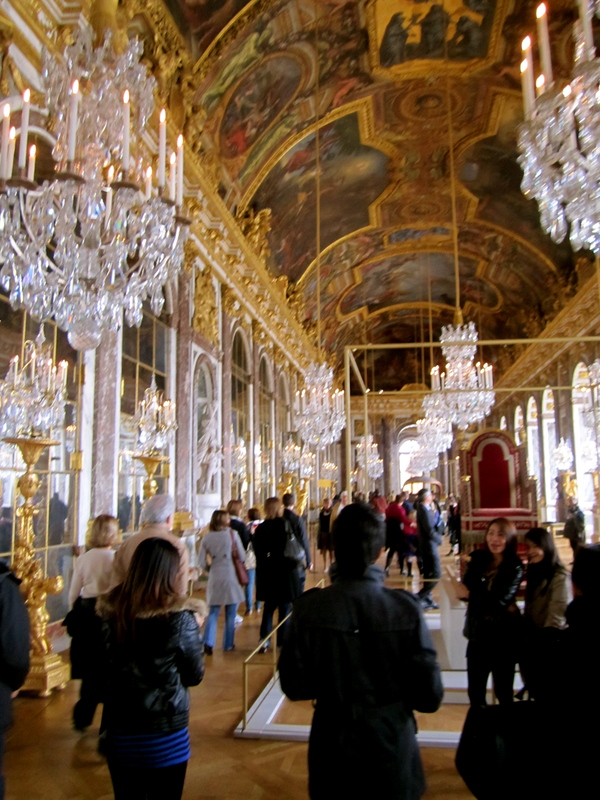 We entered through the chapel, then browsed through the inside of Marie Antoinette’s bedroom, King Louis War room, and of course the famous hall of mirrors. 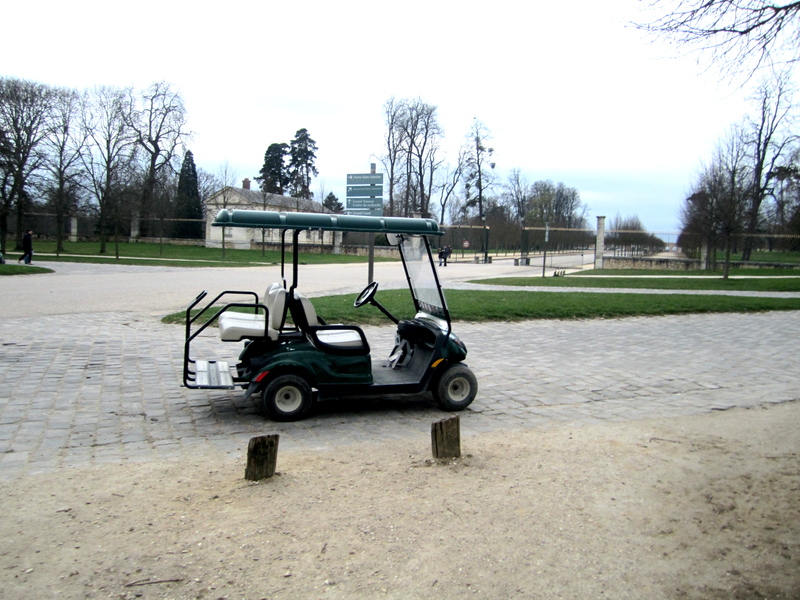 We rented a golf cart and cruised all around the palace grounds, listening to classical music. As we drove through the gardens, we sipped cappucinos and stared in awe at the fountains. As we sat on the back of the golf cart listening to the classical music I thought there could be nothing better than this. Except if I actually lived at Versailles. But I don’t think that would have turned out so well, with my sass I would have been one of the first to the guillotine. After visiting Versailles, we stopped in Marais, the Jewish district of Paris. 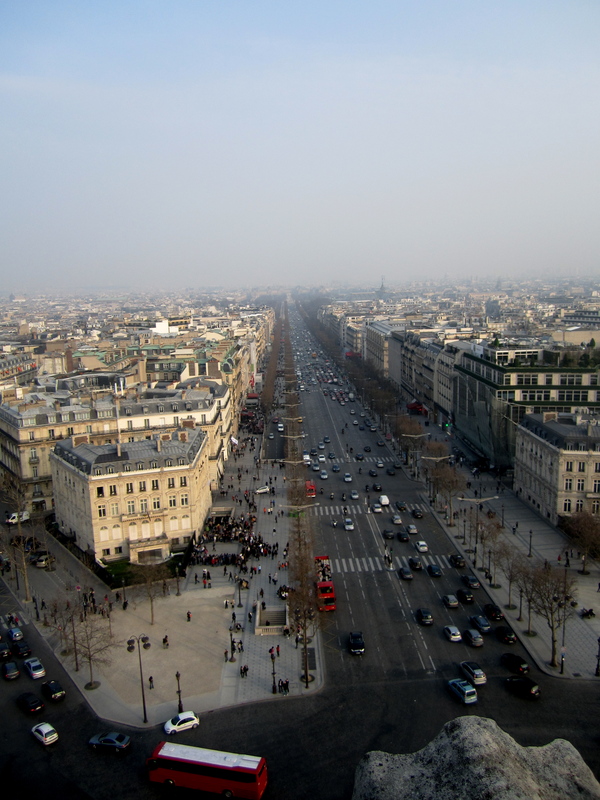 If you were to imagine Paris, Marais is what you would envision. Cobble stone streets, cute pastry shops, vintage clothing stores: my dream. 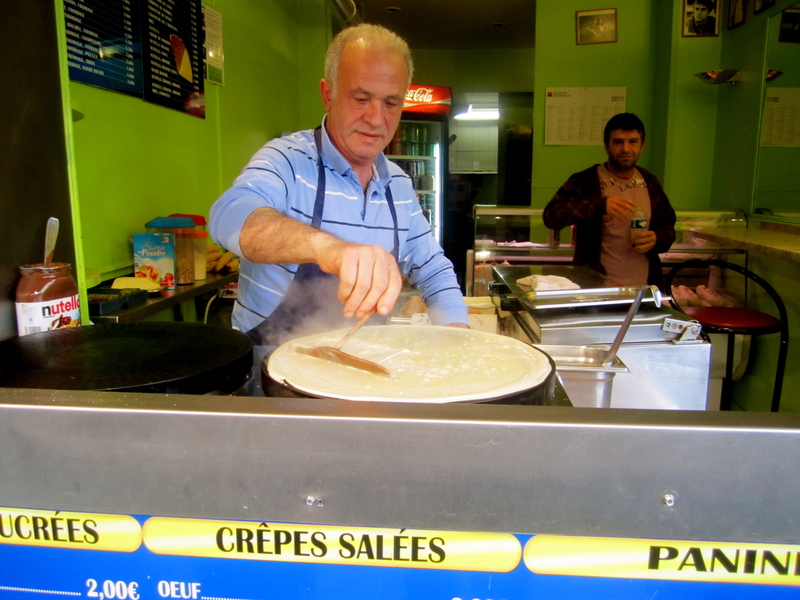 We ate falafels and hopped on the metro home to Parmentier. We got off the metro to go to the trendy club Showcase, located underneath a bridge on the seine. Literally on the river. 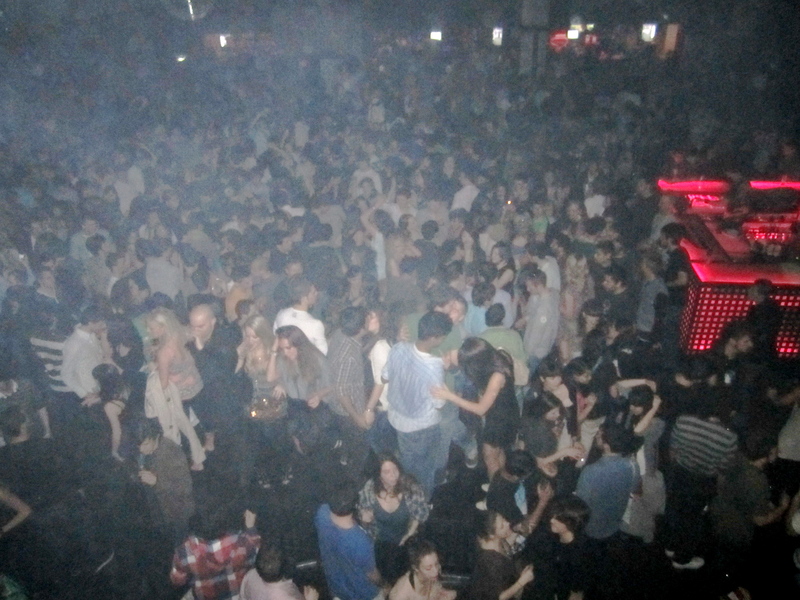 I’m sure a few parisians have fallen in after long night at Showcase. We were VIP on the guest list, but somehow our names had disappeared. We were supposed to arrive by 1:30 to cut in line, but went at 2 A.M. instead. Zoot. We also laughed. No not going to happen. They asked us what we wanted to drink we said vodka, went to the bathroom and expected a cran vod or a vod-tonic. Nope. Bottle service, a table, and grey goose. That is how I will end the blog. Because again, I will not disclose what occurred after 2 A.M. I will say though, you know when you go on a vacation and your a little disappointed that it is not like a Mary-Kate and Ashley movie. Our night was. Just more PG-13. Perhaps it was more like the Lizzie Mcguire movie on Steroids….